Due to international aviation and import restrictions, we’re unable to send this product to addresses outside Australia. Most individual products to the value of $30 or more are eligible for complimentary gift wrapping. You can select a gift wrapping colour and write a card message during the checkout process. Alperstein’s Aboriginal Art collection is a bright collection of accessories that feature the artworks of some of Australia’s finest Indigenous artists. With their bold colours and amazing designs, these pieces do true justice to the works on which they’re based. 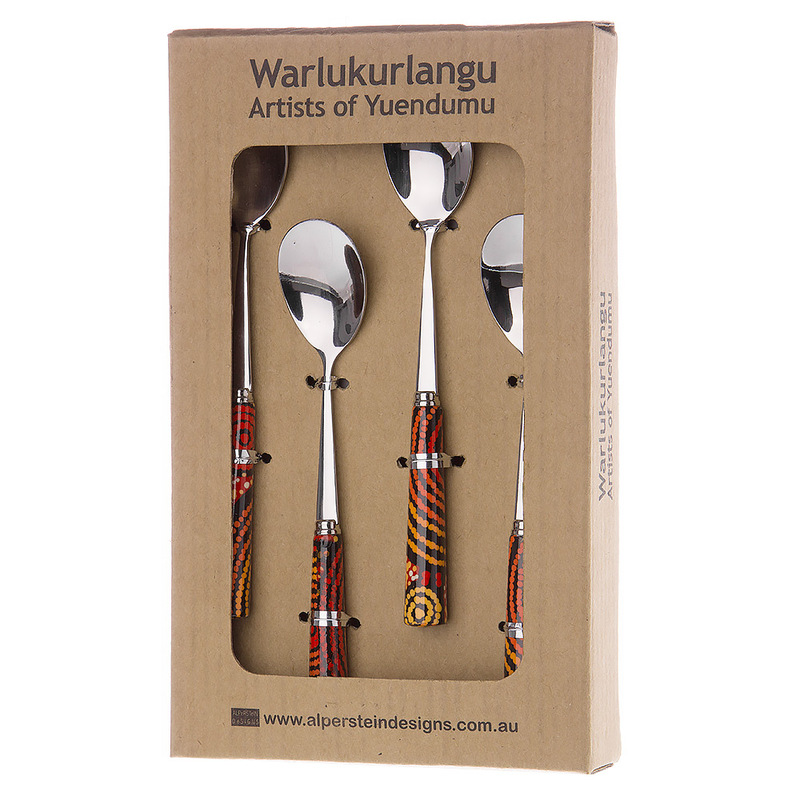 But there’s also an added bonus to Alperstine’s folk wares: royalties from their Aboriginal Art collection directly benefit the artists and their community, so you’ll be helping out isolated communities in outback Australia with your purchase. When it comes to souvenirs, there’s nothing scarier than those silver tourist teaspoons with a picture on the end… Put those away quietly and take out something still very Australian and much more beautiful: an Alperstein teaspoon. Made from stainless steel, each handle is crafted from porcelain and features cultural artworks from some of the country’s leading Indigenous artists. Made from stainless steel, with porcelain handles. Based on artwork by Teddy Gibson. Royalties from this product directly benefit the artist and their community. Presented as a set of four in an Alperstein gift box, which includes information on the artist. 3. Items are in original, unopened and undamaged packaging. Please ensure that the returned product is suitably packaged to prevent damage during return shipping. Items can be returned via post box or post office, depending on the size of the return parcel. If in the unfortunate event your item arrives faulty, damaged or incorrectly shipped, please contact our customer service team on (02) 9662 1099 or alternatively email enquiries@petersofkensington.com.au within thirty (30) days of receipt of goods. Should your item be deemed faulty, damaged or incorrectly shipped, Peter’s of Kensington will provide a gift card, exchange, store credit or refund. Refunds will be processed according to your original method of payment. If you believe your item is faulty after the 30 day time criteria, Peter’s of Kensington may require you to send the item back at your expense for assessment. This cost will be refunded to you if item is deemed faulty. The Returns Policy for in-store collect items correlate with that of ‘Purchases made from the Kensington Store or Alexandria Weekend Warehouse’ (see below), with the exclusion that a change of mind shall permit you to a gift card, exchange, store credit or refund at our discretion at the time of collection. Following collection, Peter’s of Kensington Returns Policy will only extend to an exchange, gift card or store credit at our discretion for change of mind. Please chose carefully as we do not offer exchange or refund for change of mind on Peter’s of Kensington Gift Cards and Notes of Credit. CDs, DVDs, Perfumes, Skin Care, Jewellery, Handbags, Watches, Manicure Sets, Foot Spas, Pillows, Perishable Foods, Hampers, Hair Brushes, Pierced Earrings, Pens and children’s soft toys, monogrammed or personalised items. If in the unfortunate event your item is faulty or damaged, please return the item to the Kensington Store for exchange, store credit, gift card or refund to the amount of the item(s) at the time of said purchase. Refunds will be processed according to your original method of payment. 1. Items are returned within 30 days of receipt of goods. Please contact our Bridal & Gift Registry Customer Service team on (02) 9662 7373 or email bridal@petersofkensington.com.au for further instructions to return these goods. If in the unfortunate event that your product arrives damaged / faulty or is incorrectly shipped, please contact our Bridal & Gift Registry Customer Service team on (02) 9662 7373 or email bridal@petersofkensington.com.au within 30 days of receipt of goods. Should the product be deemed faulty, damaged or incorrectly shipped you will be issued a returns form and a postage label. Once received, Peter’s of Kensington will assess the item to determine whether it is damaged or faulty, and will provide a credit, replacement, exchange or refund. Refunds will be processed back to the original method of payment. Please note that products received as part of a gift registry cannot be returned for change of mind, unless faulty or where otherwise required by law. We advise that you consider your registry list carefully and only add items that you wish to receive.